William H. Jewell married Lutitia Holcombe, daughter of Edgar Wallace Holcombe and Rosetta Wood. William H. Jewell was born on 6 July 1866. Everett Holcombe Jewell was born at Chenango Co., NY. He was the son of William H. Jewell and Lutitia Holcombe. [S25] Hannah McPherson, Holcombe Genealogy, Page 104.1/Item A-8-1-1-2-7-5-1-1-1-1. Chester Jewell was born on 13 October 1915. He was the son of Everett Holcombe Jewell and Bess M. Winsor. Probably the Newton Holcombe enumerated in the 1930 Cortlandville, Cortland Co., NY, federal census, ED 17, with a large family. [S182] Social Security Death Index (on-line), Ancestry.com, SSDI, Ancestry.com, SSAN 119-30-2638. Howard B. Holcombe was born on 19 August 1901 at Norwich, Chenango Co., NY. He was the son of Homer Ward Holcombe and Lucy M. Baker. Howard B. Holcombe lived at 19 Elm St., Cortland, Cortland Co., NY. [S25] Hannah McPherson, Holcombe Genealogy, Page 104.1/Item A-8-1-1-2-7-5-1-1-2-2. Florence Holcombe was born on 5 December 1904 at Norwich, Chenango Co., NY. She was the daughter of Homer Ward Holcombe and Inez Burnside. Lawrence Holcombe was born on 9 June 1906 at Norwich, Chenango Co., NY. He was the son of Homer Ward Holcombe and Inez Burnside. Norwich [Chenango Co., NY]: At her home on East Main street, the 14th inst., Lucy M., wife of Homer W. Holcomb, passed away at the age of 26 years. She had been in poor health for about a year but had borne her sufferings patiently and with remarkable fortitude. Mrs. Holcomb was born in Colesville, Broome county, and came to Norwich about five years ago. She was respected by all who knew her. Great sympathy is felt for the bereaved husband and the two children whom she leaves. Besides her husband and two sons, Newton and Howard, Mrs. Holcomb is survived by her mother, Mrs. Sarah Baker, who made her home with her daughter, two sisters, Mrs. Frank Simonson, of New Berlin, and Miss Arvilla Baker, of Norwich, and one brother, George Baker, of Oxford. Brief services were held at the late home of the deceased on Saturday morning after which the remains were taken to Harpursville, where burial services were held the same afternoon, at 2 o'clock. [S807] Find A Grave, online http://www.findagrave.com, Find A Grave, database and images (https://www.findagrave.com : accessed 13 November 2018), memorial page for Lucy M. Baker Holcomb (1875–1902), Find A Grave Memorial no. 118291805, citing Riverview Cemetery, Harpursville, Broome County, New York, USA ; Maintained by Paul R (contributor 47317162) . Virginia Holcombe was born on 11 July 1910 at Norwich, Chenango Co., NY. She was the daughter of Homer Ward Holcombe and Inez Burnside. 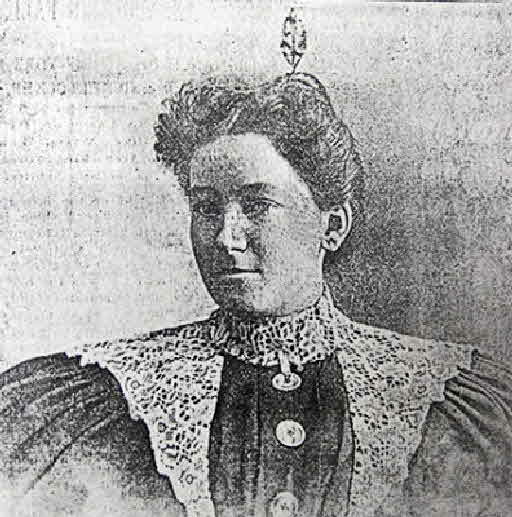 Jennie Fay was born in June 1854. She married Nathaniel Alanson Holcombe, son of Homer Holcombe and Betsey Maria Darrin, circa 1870. Jennie Fay died in 1932. Edgar Holcombe was the son of Nathaniel Alanson Holcombe and Jennie Fay. There is no evidence that this Edgar belongs to Nahaniel Alanson and Jennie (Fay) Holcombe. Their census records account for all six of their children and Edgar is not among them. McPherson says that Edgar moved from Split Log., Ill . to Gravette, Benton Co., Ark. in 1873. McPherson notes that A-4-2-10-5-2-9-1 p. 38.2 Toney Holcomb of Rogers, Benton Co., Ark., may be of this group. [S25] Hannah McPherson, Holcombe Genealogy, Page 104.1/Item A-8-1-1-2-7-5-1-4-1? Jacob Holcombe was the son of Edgar Holcombe. James Holcombe was the son of Edgar Holcombe. Margaret Holcombe was the daughter of Edgar Holcombe. Alanson Holcombe was born in 1885. He was the son of Edgar Holcombe. Alanson Holcombe lived at 322 North 6th St., Rogers, Benton Co., AR. Addie Holcombe was the daughter of Edgar Holcombe. Dorce Holcombe was the son of Edgar Holcombe. Avery Holcombe was the son of Edgar Holcombe. Cordie Holcombe was the son of Edgar Holcombe. William Holcombe was the son of Edgar Holcombe. Lou Holcombe was the son of Edgar Holcombe. Mollie Holcombe was the daughter of Edgar Holcombe. Mae Holcombe was the daughter of Edgar Holcombe. Minnie M. Holcombe was born in 1872 at NY. She was the daughter of Nathaniel Alanson Holcombe and Jennie Fay. Minnie M. Holcombe died in 1916. She was buried at New Ohio Cemetery, North Colesville, Broome Co., NY. Eva Holcombe was born in September 1886 at NY. 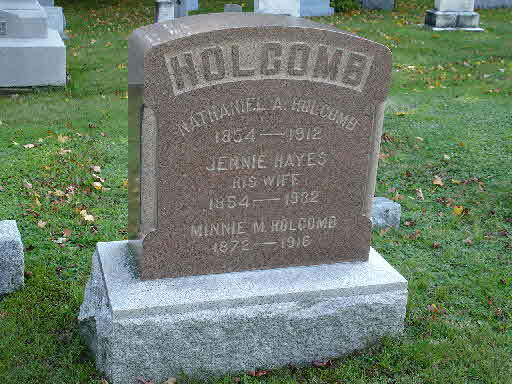 She was the daughter of Nathaniel Alanson Holcombe and Jennie Fay. Mary Belle Smith was the daughter of Richard Smith and Lena Belle Holcombe.